Today, PG&E customers drive one-fifth of all electric vehicles (EVs) registered in the United States. As the fuel provider for tens of thousands of EV drivers, we are committed to making ownership easy and affordable. We are proactively sharing the benefits of driving electric with our customers and local communities. PG&E is also working to enable the large-scale electric infrastructure needed to meet demand for EVs as well as California’s critical clean air and greenhouse gas emission reduction goals. We are advancing the adoption of EVs by providing customers with access to information, programs and resources to help them make informed choices. We are also leading innovative new research to plan for a future where hundreds of thousands of customers can charge their EVs with PG&E’s clean energy. Conducting workshops and outreach to help current and potential owners understand the benefits of EVs and steps that can help them save money, such as charging on rates designed for these vehicles. Leading pilot projects and research to prepare for more EV drivers charging their vehicles on our grid. Current efforts include piloting demand-response smart-charging for EV owners to use their batteries as a resource for delivering energy when demand peaks and studying where to best locate direct-current (DC) fast charging stations, which can recharge an EV’s battery in about 30 minutes. Forecasting EV growth and measuring impacts to the electric grid. Charging an EV can add about one-third the energy demand of an average house to the grid. PG&E is measuring EV adoption and the resulting impacts to grid infrastructure to plan for this growth and achieve smooth and sustainable operations for PG&E and our customers. 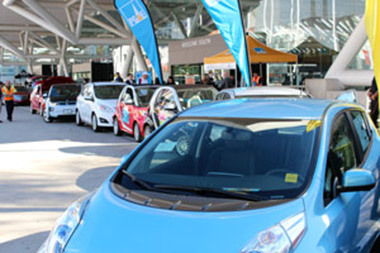 PG&E participated in the San Francisco International Auto Show, displaying locally made plug-in hybrid PG&E fleet vehicles and sponsoring EV test drives. Participated in more than 20 events across our service area to educate customers about the benefits of EVs. These ranged from National Plug-In Day in Cupertino, which set a world record for the longest EV parade, to the AltCar Northern California conference, which brought together local governments and others. Provided an array of online tools to help drivers navigate the process of researching, buying and owning an EV, from charger installation to advice on rate plans. We also tested online tools with approximately 30 EV dealers—focused on rate analyses, daily travel requirements and incentives—to help car buyers evaluate ownership. Launched a pilot program to allow residential and commercial customers to install a third-party submeter to measure their EV charging usage. This allows customers to have their EV charges billed at a different rate than home or business usage. Offered a vehicle charging program for employees who drive their EVs to work. We have installed more than 80 Level 2 chargers at our facilities, which provide up to 25 miles of range for every hour of charging, with plans to install about 50 more in 2015. PG&E’s utility fleet also includes a growing number of plug-in vehicles. 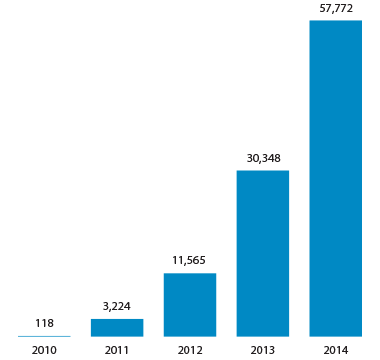 The number of EVs in PG&E’s service area nearly doubled in 2014, with close to 60,000 registered battery and plug-in hybrid EVs. In 2014, 4.5 percent of vehicles sold in PG&E’s service area were EVs, with some counties reaching the 10 percent mark—much higher than the national average. With four years of mass-market EV sales, adoption is already outpacing early hybrid vehicle adoption among PG&E customers. PG&E predicts that by 2020, our customers will own and operate more than 300,000 plug-in vehicles. 1 EPRI, R.L. Polk Data, 2014. The advanced planning by PG&E, California’s other utilities and regulators is paying off with relatively trouble-free adoption of EVs, as confirmed by a 2014 joint utility report. 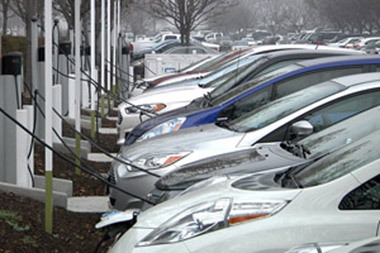 Of the 50,000 plug-in vehicles owned by PG&E customers at the time, only 89, or 0.2 percent, required distribution service upgrades as a result of the added electric load. PG&E began a program to encourage employees to make the switch to EVs. Working in partnership with Ford and General Motors, the program helped more than 600 employees purchase EVs, many of which are charged at PG&E facilities via our workplace charging program. As EV ownership continues to grow, PG&E is actively designing programs to meet customer needs. For example, PG&E proposed a new program with the CPUC to undertake a significant deployment of EV charging infrastructure across Northern and Central California. If approved, this program would represent a significant increase in utility deployment of EV charging stations in the country. The program, which will also help meet state clean air and greenhouse gas emission reduction goals, would deploy 25,000 Level 2 charging stations at commercial and public locations, including multi-family dwellings, retail centers and workplaces. The program would also support state-wide EV travel by installing 100 DC fast chargers. PG&E would own the infrastructure and partner with third-party EV service providers to operate and maintain the network of charging stations. A recent ruling by the CPUC has proposed to reduce the initial deployment to about 2,500 charging stations, with an opportunity for PG&E to seek approval for the full program at a later date. By supporting market acceptance of EVs, the program would create new opportunities for other infrastructure and technology companies, help keep California in the forefront of EV innovation and create new jobs in local communities. Pending regulatory approval, PG&E looks to begin deployments by 2017.